Lists like this are usually so much clickbait, I know, but I thought it was nevertheless worthwhile to compile a list of most of the reasons why I became and/or remain an Orthodox Christian. Some of these things were not really on my radar when I became Orthodox in 1998, but they are part of the reason why I genuinely do love belonging to the Orthodox Church (which is why “and/or Remain” is in the title). The nature of lists like this is such that they can’t constitute apologetics, really, nor is this one (at least) intended to be universally applicable — these are my reasons. They may not be someone else’s. It will also become apparent that my background as an Evangelical prior to becoming Orthodox is a major factor here. So, all that said, here’s the list. I believe the Orthodox Church really is the one, true church of Christ. There’s a lot that could be said here, but the reason why I believe this is that I examined both the Scriptures and the early history of Christianity, and I became convinced that the only church that matches them both is Orthodoxy. Particularly formative for me were the writings of St. Ignatius of Antioch, a disciple of the Apostle John. The church life he described was definitely not what I saw in Evangelicalism. Since he was someone who learned how to be a Christian from the Apostles themselves, I wanted to be in his church. Orthodoxy takes history seriously and doesn’t gloss over the hard stuff. It also doesn’t pick and choose from early Christian witness to develop a streamlined “system” of theology that is easy to swallow. Rather, because Orthodoxy is truly the community descended from the Apostles, within its theological memory are centuries of dogma, doctrine and theological reflection. Not all of it is totally consistent or easy to sort out, but it is nevertheless one great river of truth with an overall unified direction. One doesn’t see that in the same way in Roman Catholicism (there are several major turns in history), and it is impossible to find that in Protestantism. Most Protestants aren’t even concerned with it. None of that means I regard non-Orthodox Christians as damned, nor do I even regard all Orthodox Christians as definitely destined for eternal bliss. And Orthodoxy’s truth is no testament to me. Orthodoxy is true, but not because of me. Orthodoxy gives me something to do. I don’t mean that I was bored and needed something to entertain me. I mean that the Christian life as I had been taught it prior to becoming Orthodox was essentially non-critical. I had been “saved,” and there was really nothing critical to do after that. I should try to be moral, of course, and get other people to get saved, too, but those things weren’t really necessary to the big question, which was: “Do you know what would happen to you if you died tonight?” Well, I knew. I was “saved.” I was going to Heaven. But what if spiritual life is actually all critical? What if you need to endure to the end to be saved? What if being a Christian means working out your salvation with fear and trembling? Orthodoxy provides a full-bodied, full-souled spiritual life that assumes that everything you do as a Christian makes you either more like God or less like Him, and because becoming like God is what salvation consists of, that means that everything you do is critical. You haven’t “arrived” in this life. You should be moral and you should be evangelistic not because they get you bigger rewards in Heaven but because those things are part of what it means to cooperate with God so that you can be saved. Orthodoxy gives me a way to see and touch God physically. The Son of God became the Son of Mary, and that means that He became visible and touchable. In Orthodoxy, the implications of the doctrine of the Incarnation are that the divine presence — holiness — actually becomes present in the material world. Now, one can argue that that presence is uniquely present only in one physical place — the human body of Jesus — or one can be consistent and see how holiness shows forth in lots of other physical places both in the Bible and in subsequent Christian history. Saints’ bones, apostles’ shadows and even handkerchiefs touched by apostles have all showed forth the power of God. Within that context, when Jesus said “This is My Body” and “This is My Blood,” it makes more sense to take Him seriously and not just metaphorically. That’s why St. Paul warned that people who received Holy Communion unworthily could get sick or even die. If it’s “just” a symbol, why would it do that? The physicality of Orthodoxy — sacraments, incense, vestments, church architecture, icons, etc. — don’t get between me and God. They put me in touch with God. A bridge between two cliffs does not get between the cliffs but rather connects them. Orthodoxy’s many physical elements not manmade magic, but the working out of God’s gift of the Incarnation, the reconnecting of God and man. Orthodoxy really is one church. Unlike the denominationalism of the Protestant world, the various churches of Orthodoxy really do have to talk to each other and work things out. A Presbyterian and a Lutheran may each recognize each other as Christian, but they have almost no stake in each other’s internal church life. The same even holds true of someone belonging to the PCA and someone belonging to the PCUSA (both Presbyterian denominations). They don’t have to work anything out between them. A PCA church plant does not in any way infringe on the territory of the PCUSA, because they’re not the same church. Orthodoxy may often bicker and fight (though most parishioners never see this unless they happen to be in a dysfunctional parish), but the fact that we have such bickering and fighting with each other means that we recognize in each other that we are one Church, that we have a problem and that we need to fix it. Protestants always have the option of just splitting (and once splits occur, they don’t have to bother with each other), while Roman Catholics can ultimately appeal to the Vatican, who can impose solutions that work for the Vatican but might not work for everyone else involved. Orthodoxy is a faith for the whole life. Because Orthodoxy comes with a vast set of expressions of its tradition, you can never exhaust it all. There is always something new not just to learn but to become. While we don’t really “arrive” until the next life (and I’d argue even that is not an arrival; that is, it’s not the end of the road of salvation), there are many way-stations in this life that delight and grant joy. The difference between Orthodoxy and Evangelicalism in this regard is that I’m talking about not just growing in wisdom, which is common to all religious traditions, but that Orthodoxy tracks many stages of spiritual development throughout a whole lifetime. I remember one time hearing a monk explain the response he got from a holy elder on Mount Athos after asking him many questions. The elder replied that some things just wouldn’t make sense to him until later, until he’d received some level of illumination (theoria). It’s true. One cannot read a “Statement of Faith” from Orthodoxy (not even the Creed) and say, “Ah, yes. That is everything Orthodoxy teaches. I understand it now.” Again, that’s not a bug. It’s a feature. Yes, we like things to be simple, to be readily accessible to everyone, but any faith that is not complex enough to address all the complexities of human experience is not worthy of the dignity of mankind. Orthodoxy provides that in a way that I haven’t found anywhere else. Orthodoxy is a faith for the whole world. Orthodoxy is a faith for the whole person. Mankind is not just emotionally moved by beauty, but he aches to be near it, to create it as much as that is possible. More than any other iteration of Christian faith, the Orthodox Church knows how to envelop the worshiper with beauty in all five (or more!) senses, both otherworldly beauty that transports the worshiper and otherworldly beauty that transforms the earthly. One might describe this as aesthetic, but it is not “mere” aesthetics in the sense of something that appeals only to the senses, perhaps for entertainment value, but goes nowhere in particular. This is aesthetic in the sense that God Himself is beauty. That is why Orthodoxy, while sometimes homely or homey, is never cheesy. It is timely and timeless, but not “contemporary.” The beauty of Orthodoxy addresses the whole human person in multiple ways. It is not a faith just for the “soul” or the “heart,” but for the body, as well, including our ability to apprehend beauty. God really does love you the way you are, and he loves you so much, he won’t leave you that way. There seems to be a constant battle these days, especially within Protestantism, over whether God should be perceived as loving or as a judge. Even those who preach that God is love still tend to preach a God Who is angry at you for your sins and has to be appeased. But Orthodoxy preaches the God Who is consistently loving, a God Who loves with such strength that His love will change you, if only you will cooperate with it. The change won’t be lousy, either, turning you into some goody-goody prude. Rather, it will be a change into authentic personhood, where virtue is striven for because of communion, not because of adherence to arbitrary rules. Orthodoxy is both mystical and rational. Some Orthodox will oppose the mystical to the rational, but that’s a mistake, I believe. For all the apophatic theology (theology which emphasizes our inability to know God with our minds), there is also a lot of cataphatic theology (theology that makes clear, positive truth claims) in the tradition of the Church. We don’t have to choose one or the other, nor are the two really alternatives to each other. Apophatic theology is also not merely a “corrective” to cataphatic theology. Rather, both are simply ways of talking about theological emphases within Orthodoxy. It is not as though, when I am serving the Divine Liturgy, I switch on the “rational” part when preaching the Gospel and then toggle the switch to “mystical” when I drink from the Chalice. All these things are in play simultaneously. I love that, and I haven’t really encountered that anywhere but in the Orthodox Church. No Christian body takes asceticism as seriously as Orthodoxy does. Roman Catholicism has it in its tradition, but it is mostly ignored. Yet Orthodoxy expects all Christians to fast, to stand vigil, to be as non-possessive as possible, etc., and it provides a program for how to do that. You don’t have to make it up for yourself, because the tradition is already established. And it’s also customizable according to the pastoral discernment of your father-confessor. Asceticism is a way to do real battle with the broken modes that the human will functions in. It allows a man to take control of himself in a powerful way so that he can redirect his God-given powers and energies back toward God and away from his base appetites. Asceticism doesn’t save anyone, but it certainly does help. Why? Because we are only saved to the degree that we want it. Asceticism helps us to want it. And as anyone who has really fasted for all of Lent and then tasted that first taste of roast lamb at Pascha can tell you, asceticism actually makes the good things of this earth taste better. Far from being a denigration of God’s good creation, asceticism returns the creation to us and opens up its beauty in ways that consuming it without restraint cannot ever do. Orthodoxy aims higher than any other Christian faith. While theosis (deification/divinization) is not the only model of salvation in Orthodox Christian theology, it certainly makes some of the strongest claims. There are hints at doctrines of theosis in Roman Catholicism. (I am not aware of any Protestant groups that teach it.) Yet it is only in Orthodoxy that one is taught that salvation means to become by grace what Christ is by nature, that “God became man so that man might become divine” (Athanasius, On the Incarnation) that becoming “partakers of the divine nature” (2 Pet. 1:4) is actually expounded upon. “I have said, ‘ye are gods, and all of you are sons of the Most High’” (Ps. 82:6) is taken very seriously. You won’t find that anywhere else. Even Pentecostals who teach that you can be chosen by God, spoken through by God, etc., aren’t really teaching that you can enter into such union with God that you begin to take on the divine attributes. But that is exactly what Orthodoxy teaches, that the transfiguration, death, resurrection and ascension of Christ are all what it truly means to be a Christian, that mankind is now seated on the very Throne of God Himself, and being in Christ means being seated there, too. Pretty daring. But why settle for less? So those are some of my reasons. What are yours? The Very Rev. Archpriest Andrew Stephen Damick is pastor of St. Paul Orthodox Church of Emmaus, Pennsylvania, author of Orthodoxy and Heterodoxy, Bearing God and An Introduction to God. He is also host of the Orthodoxy and Heterodoxy and Roads from Emmaus podcasts on Ancient Faith Radio, co-host of The Areopagus podcast, and he is a frequent speaker at lectures and retreats both in parishes and in other settings. You can follow him on Facebook and Twitter. 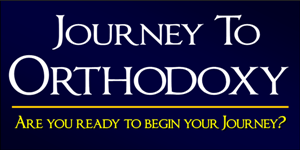 Launched in November 2013, Discovering Orthodox Christianity is a series of talks, shows, and presentations designed to introduce and explain the basic teaching of Orthodox Christianity. Sponsored by the Leadership 100 Endowment Fund the series covers a wide range of topics with the goal of educating the viewer in simple, easy to understand terms. Every believer's primary need is to come further into union with God (Theosis), and the whole work of Orthodox Christianity is to enable this.